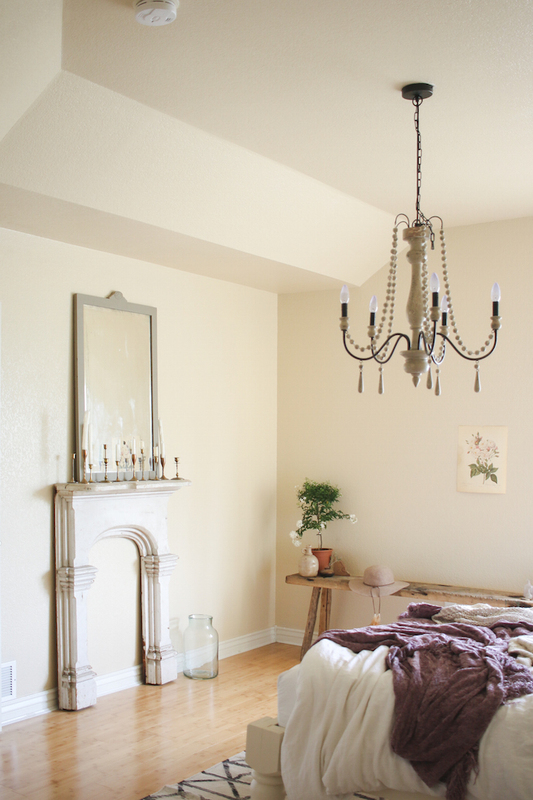 Vintage Whites Blog: Vintage Modern Bedroom Makeover with Cocoon by Sealy + a giveaway! 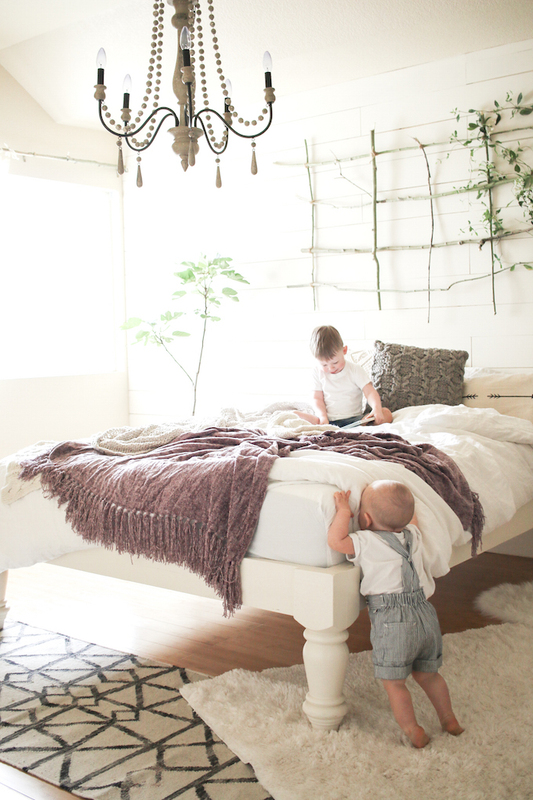 Vintage Modern Bedroom Makeover with Cocoon by Sealy + a giveaway! Tanner and I have been renters for our entire marriage which is really hard for two people obsessed with creating spaces just the way we envision them. That being said, it does allow us to BE creative and find ways to work around an uninspiring space! We've been lucky to have landlords in the past who bought materials for us and let us do what we wanted, but most of the time it's on our own dime if we want to make improvements. The house we are in now is not bad at all, but the color of the paint and floor makes everything too yellow for my taste. 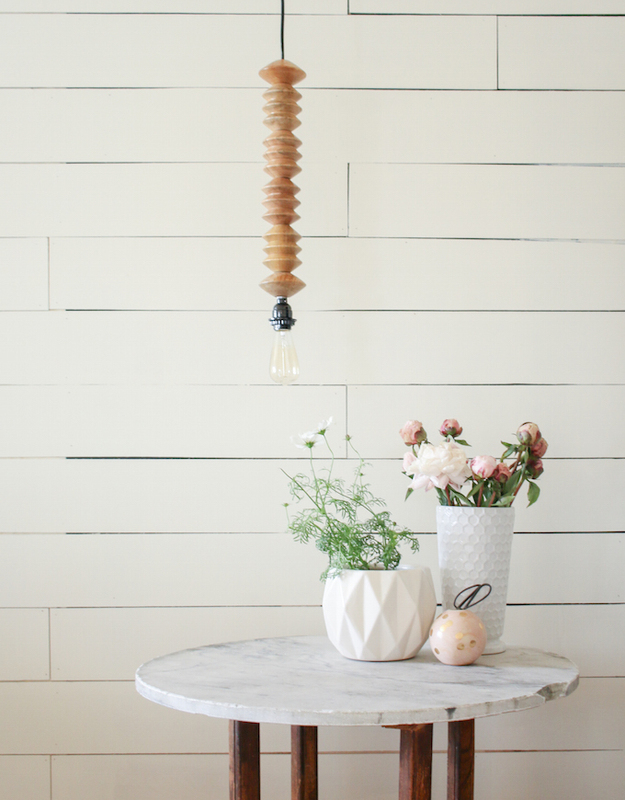 Tanner came up with a great idea to build a temporary wall out of plywood and use it as a base for shiplap! We already had most of the materials left over from other projects, and he cut sheets of plywood into boards for the shiplap! We thought this would give the room a focal point and tone down some of the tan color on the walls. I LOVE how it turned out. I had him leave imperfect gaps and some of the outlines unpainted because I love the texture and contrast it gives the room. I have SO MUCH to tell you about in this post, but I want you to see what the room looked like last year and then right before this overhaul, so click those links first and then come back. Here's one of the projects I'm excited about: this amazing little side table!! We found the base at the Habitat for Humanity thrift store for $20 and the marble top came from a garage sale last year for $5! I have been holding onto it for just the right base. It could not be more perfect! Vanessa and I partnered with Cocoon by Sealy to turn our bedrooms into our "happy place," and I FINALLY feel like my bedroom is my happy place. Even Tanner said, "I could hang out in here. It's really comfortable and bright." Yes, it is, thanks to our new mattress and his great idea!! We have been sleeping our new Cocoon by Sealy mattress for two months now, and LOVING it! My hips normally hurt at night but not since we've had our Cocoon. You can read more about our initial thoughts as well as a video on setting it up here (so easy...still can't believe it came in a box delivered to our doorstep! I was able to set it up by myself)! Cocoon by Sealy was kind enough to provide another mattress for a giveaway, AND a promotional code for a $50 cash gift card with purchase of a mattress from now until May 31, 2016! Visit cocoonbysealy.com and enter the code VINTAGE50 to redeem your discount! Details on the Cocoon by Sealy mattress giveaway is at the bottom of this post! Vanessa sent me a photo on pinterest of this really neat grid made out of sticks tied together and I HAD to have one in my bedroom! It was actually pretty easy and quick, and I love that I can start growing vines on it! A living, breathing, energizing headboard! 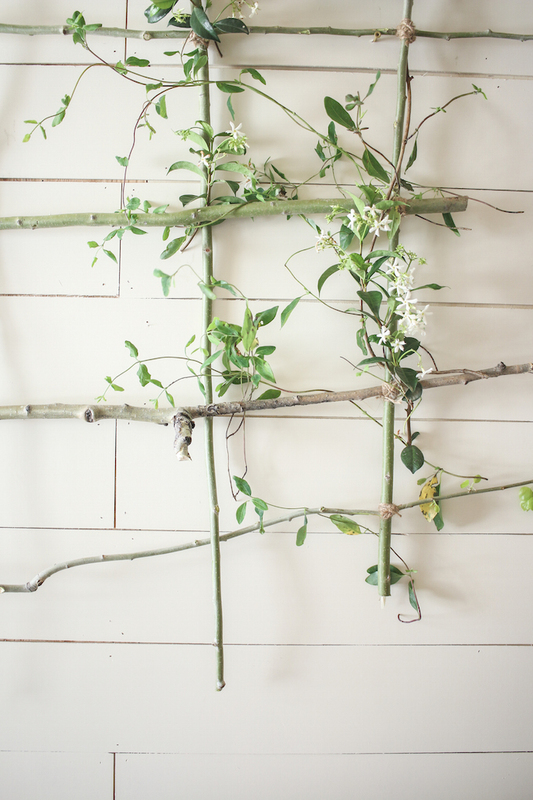 I wrapped a few loose honeysuckle and star jasmine vines around it. Can't wait to get them growing that tall. Any pointers on how to start that?? All of the bedding I used is a mix of thrift store, garage sales, and new. I am still loving my linen bedding set from H&M and don't see changing anytime soon. It's so comfy! 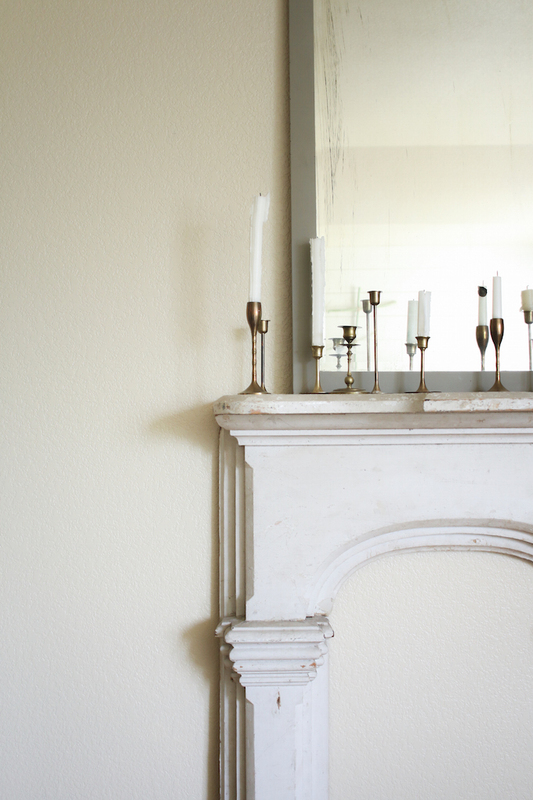 These brass candlesticks have been with me for years -- I started collecting them when I'd see them at thrift stores, and I always display them somewhere! I love the dainty stems! I really am loving the light that the white wall adds to the room. I am sitting on my bed writing this post and I haven't actually worked in this room since last year! It feels SO relaxing -- truly my happy place! Now, we want YOU to experience one of these phenomenal mattresses! 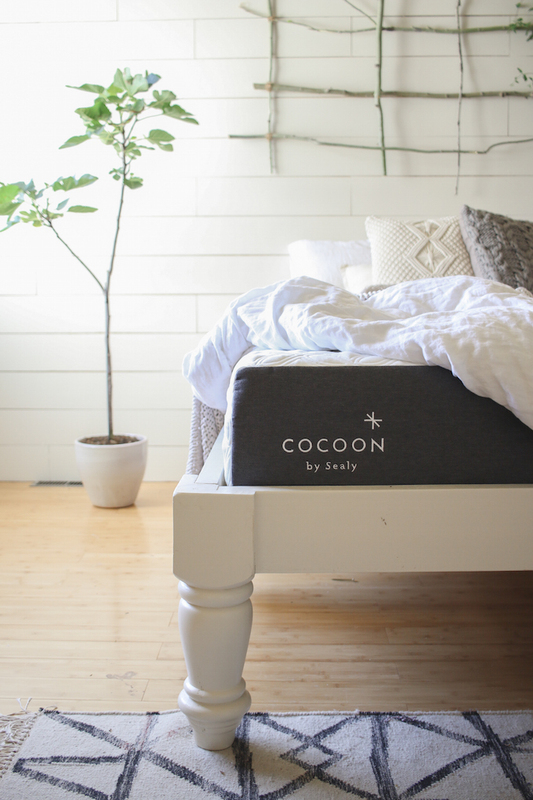 Enter our giveaway for a Cocoon by Sealy mattress!! Details are below -- we'll pick a winner in two weeks! Also: if you're planning to use the 'VINTAGE50' promotional code at cocoonbysealy.com for a $50 cash gift card when you purchase a mattress, be sure to do it before May 31, 2016! Did you make your bed frame? I love the simplicity of it! Your room looks SO lovely! 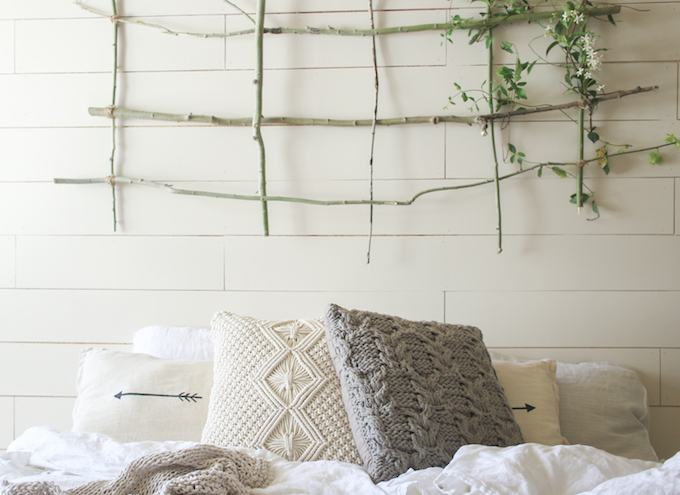 I adore the wall art created from sticks. My son was just helping me turn our gross mattress yesterday and remarked "Mom, you really need to get a new mattress." Fingers crossed! I adore the simplicity. I need to be brave and know the walls don't have to be so busy in a room to feel decorated. That bed, mattress and bed frame, is everything!!!! I love that side table. I can't believe you made it for only $25... it looks so gorgeous and expensive. Really I love everything about it. You can come do mine anytime! It's so beautiful and so cozy. Thank you for the inspiration. My bedroom is a hellhole right now. I need to make it cozy. What is the story with that mantelpiece?! I'm obsessed with that!! Love the "headboard"and the bed looks so cozy and comfy! 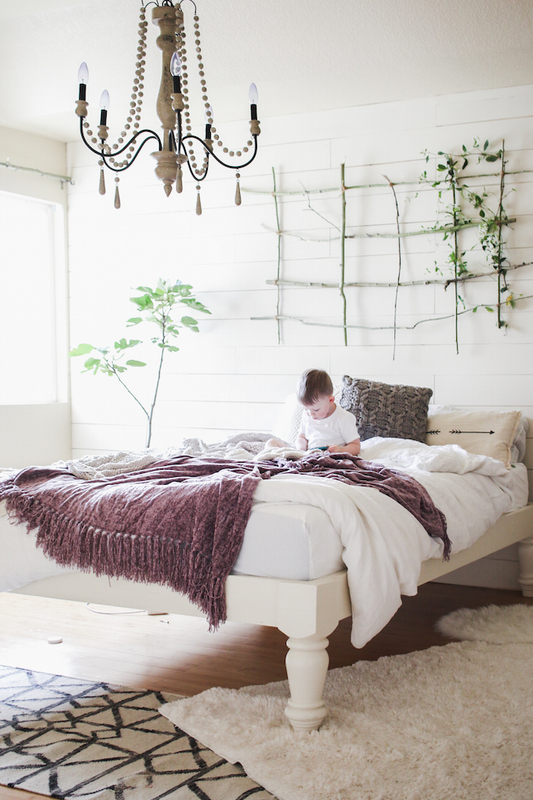 I love how the bed almost looks like a farmhouse table!! I am intrigued by this mattress. Currently saving for a new one as mine is shot. Your husband did an exquisite job on the platform bed! Love it! Love your bed! We're also renters, so it's great to get temporary decor tips! I too enjoy the art made from sticks. Lovely giveaway. Thanks for the chance. I like the bed frame. I lke the wood floors. I wish I had wood throughout my home. I have the worst back and neck problems and have been dying to get a new mattress that's affordable! I have been obsessed with vintage whites forever! You have the most beautiful posts and details! Love absolutely everything about you guys! xoxo! We own a business and I stay home with three boys, home educating. My husband and I work day and night, because we had a vision years ago. See www.coydogstudios.com to have a look. We could Really use a good night sleep! Please align with me universe!! Love how bright the room is and the headboard is so beautiful. Love the table base. Habitat for humanity stores rock! I love the faux mantle! I love the overall look of the room! You all did a great job making your vision come to life--I looked at the before pics! My particular favorites--that WALL!!! 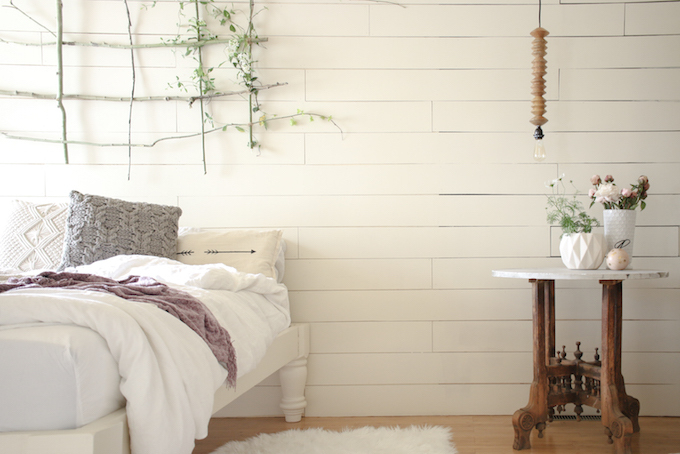 What a great idea to build a temporary plywood wall for the shiplap!!! I am going to have to use that idea at our house! I also love the great job you did on making that side table! Can't believe you got the marble top for $5! And I love the bench! - Cynthia E.
I love the colors and those knit/chunky pillows. My favorite thing is the white plank wall, the clean lines, the use of greenery for accent, and the open air. 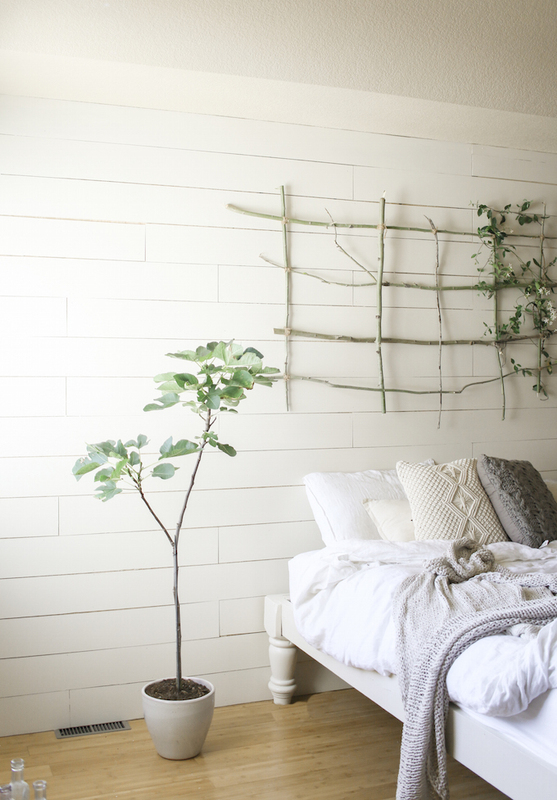 I absolutely love how you brought the outdoors in with the tree branches, it's genius and since we live in a very rustic type home I may have to do this in one of our rooms to match the decor! This space is and beautiful and peaceful! Love the wall hanging so much. I just saw this blog post and it is incredible, regardless if I win the mattress I will continue to read your posts! I love that it is simple but beautiful...and the decor and coloring makes the room look very open! I'm the biggest fan of garage sales, so your special marble top find, has me all googly-eyed! I can't wait to move in with the love of my life, and make our house a haven! The entire look is fantastic. Nothing better than white walls! Besides the adorable children, my favorite thing in this room is the wall decor behind the bed. It's unique and eye-catching. When I look at this picture I'm always drawn to that piece. I love how bright the room is! It looks so crisp and clean. 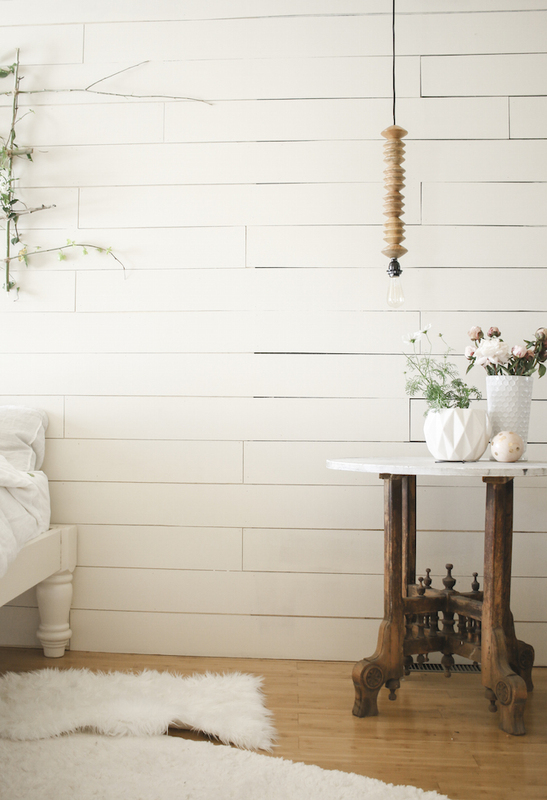 Love your peaceful bedroom. You really nailed it on the table base, perfection. Love this space! its beautiful and so serene! I spy an object enthusiast vase. Where are the planters on the marble top table from? 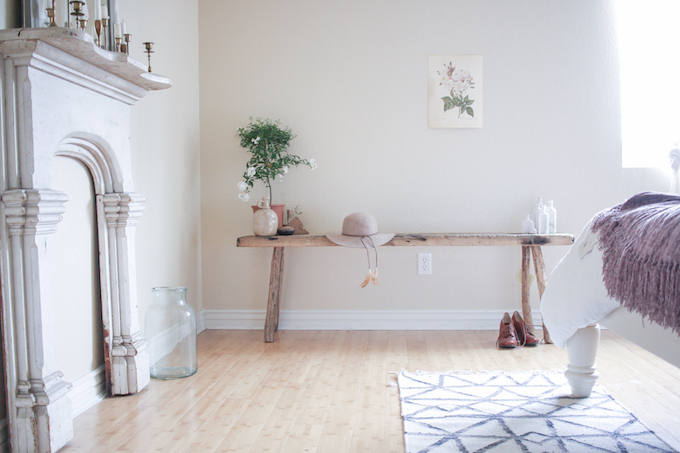 I've been searching for a white planter similar to the one pictured here. Thank you so much!